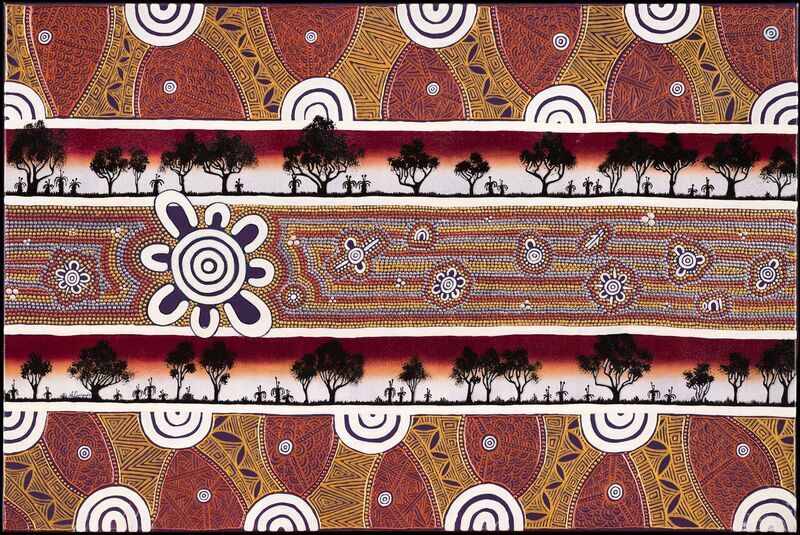 Across the Murrup Barak site, we have used elements from the artwork Teaching the Next Generation by Natashia Corrigan. This work was commissioned by Murrup Barak in 2016. The storyline within this painting tells the importance of community and knowledge. Aboriginal communities keep our cultural heritage alive by passing on our knowledge, arts, rituals and performances from one generation to another, speaking and teaching languages, protecting cultural materials, sacred and significant sites, and objects. The copper sections represent the curve of the hills and mountain ranges while the straight lines are the paths and tracks our ancestors created while walking through the bush hunting for meat for their families. The middle section tells of a journey our communities make to gain knowledge. Each of the smaller meeting place symbols represents a variety of community/family groups making their way towards the larger meeting place. The single symbols represent an Elder, a woman with a Coolamon and digging stick, kangaroo tracks and a berry bush. The two ribbons of Gum tree silhouettes with a vibrant sunset background is an impression of growth, a connection back to country and our Mother Earth. Also a reminder of new day dawning when the sun rises again, a time to reflect and start fresh.. I chose to use these warm colours as a reflection of the building Murrup Barak is based. It gives a warm yet classic feel much like the brick work and stone work used in the area, it is also very similar to traditional Ochre colours used by our ancestors in the dreamtime. I’ve enjoyed creating this artwork and I truly hope all who sees it receives blessings from myself and my ancestors who lead the way before me.. Proud Jinabara – Bundjalung Woman.